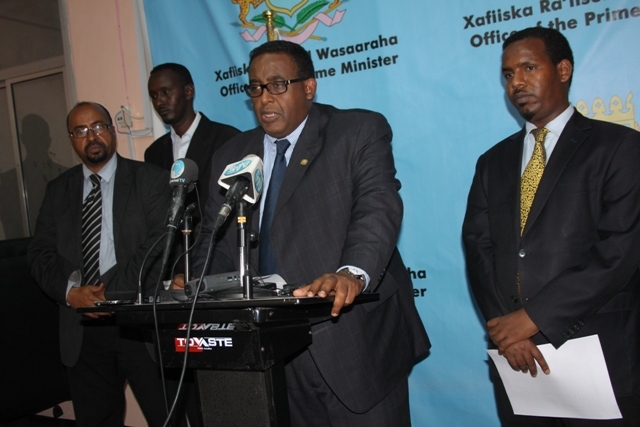 MOGADISHU, 12 Jan. 2015 (Qalin) – The Somalia Prime Minister Omar Abdirashid Sharmaarke announced a cabinet list consisting of 60 members on Monday morning at a ceremony in the Statehouse in Mogadishu. The PM announced 25 ministers, 25 deputy ministers and 9 state ministers who will replace the former cabinet that lost the vote of confidence in the parliament in December 2014. "I make sure that there will be real accountability in order to make sure that we achieve the vision 2016, to make the country host free and fair elections, so that I am very hopeful that the parliament will approve my cabinet” he added. There are new faces in the cabinet but the PM returned most of the former cabinet ministers who served under his predecessor and among them are the Minister of foreign affairs Abdirahman Duale Beyle, the minister of justice Farah Abdulkader Mohamed, the defense and information minister Mohamed Sheikh Hassan, the finance minister Hussein Abdi Halane. The controversial former National Intelligence and Security Agency chief Abdullahi Sanbololshe, who was fired by the cabinet in September last year is nominated as the minister of home security. The PM will need the parliament to approve his cabinet members who will face a divided parliament, which hardly fought in December during a motion of no confidence against the former PM. About 100 parliament members warned the PM to avoid adding any former cabinet member to his list and vowed to block the cabinet approval in the parliament if the PM adds the names they target, which are the ministers allied to the president.